A lighting upgrade cannot salvage this stale mess. I’m one of those folks who thinks wrestling games peaked in the Nintendo 64 era. I spent so many hours with the AKI-developed Nintendo 64 wrestling classics like WCW/NWO: Revenge, WrestleMania 2000, and WWF No Mercy. The latter is still played and modded to include the current rosters to this day. For more than 15 years now, developer Yuke’s has been cranking out WWF/WWE games under publishers THQ and 2K. The games were born on the Playstation under the Smackdown name and currently release as WWE 2K. While some parts of the experience have improved over those 15+ years, many things are just as bad as they were in the last year of Bill Clinton’s tenure as President of the United States. Publisher 2K Games took over control of the WWE license following the meltdown of THQ. 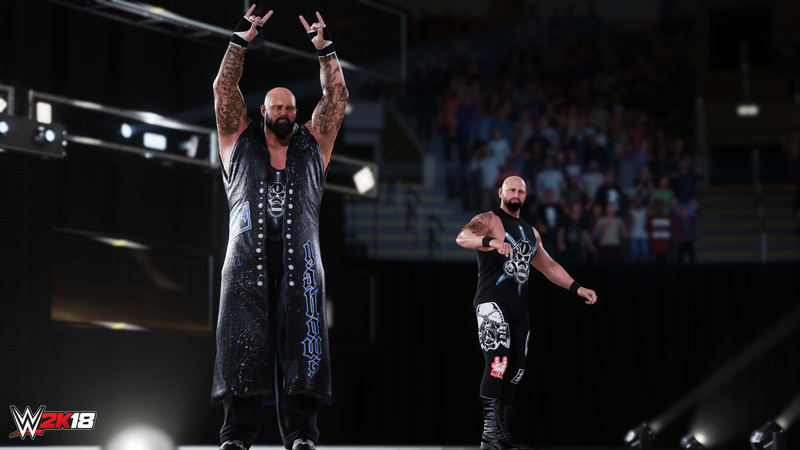 For its first title WWE 2K14, the publisher retained developer Yuke’s, but promised that the 2K Sports staff would be involved in pushing the series to new heights. For fans who had been playing the series for years, that promise proved to be fruitless as the new game was essentially the same as its predecessors. 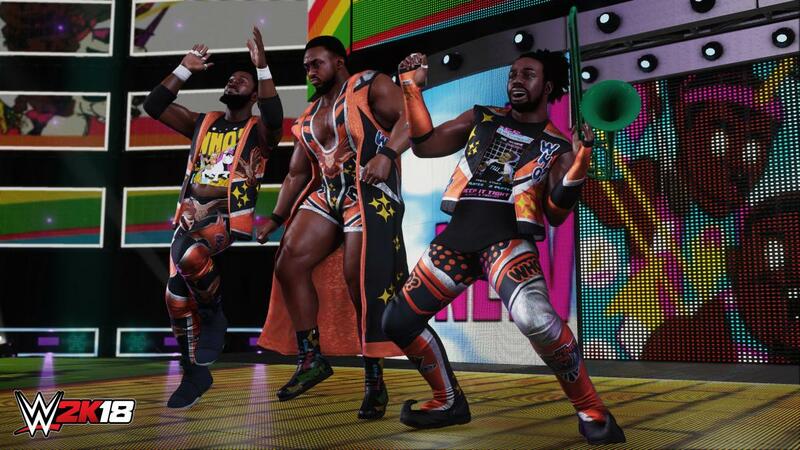 In the years following the Yuke’s/2K partnership, the game has made slow strides towards being something that videogame wrestling fanatics could be proud of, but still feels like a set of fancy band aids over the original foundation. WWE 2K15 was released with an all-new engine and was incredibly bare on features compared to the titles that came before it. The series has almost reached parity with the last generation standouts, but still feels incomplete. The marquee additions to this year’s game are the “revamped” career mode and an online career mode, dubbed Road To Glory. Both modes let players work through matches and events in order to earn upgrades for their wrestlers. Road To Glory takes the progression online and pits you against other players trying to upgrade their MyCareer characters. I began my WWE 2K18 journey by opening up the game’s create a superstar menus and spent close to an hour perfecting the cyber representation of my wrassle-self. While I’ve had a better experience with the creation tools in older WWE games, the system provided here gives you enough freedom and options to dial in some excellent results, especially if you can master manipulation of the face photo import tool. This tool lets you upload your own face shots into the game to overlay onto expressionless character models. The face modeling tools leave much to be desired, but if your face/head happens to be a close match to one of the 12 template heads provided, you can get some creepily realistic results. Once I had myself looking good, I entered the moveset editor to select what type of wrestler I would be in the ring. By far the best of the creation tools, the moveset editor gives you total control over the moves, animations, and reactions your virtual wrestler can use (or use to abuse). As a big pro wrestling fan, I spent around 45 minutes picking the stuff I liked and working out a nice array of moves and taunts. I then entered the entrance creation tool to customize my wrestler’s introduction. Music, lighting, pyro, and animation options are plentiful and can be arranged very intricately if one so chooses. For players who would rather not spend an eternity fine-tuning their virtual grapplers, both the moveset and entrance editors offer quick presets for easy use. It took almost 3 hours, but I had my cyber self perfected and could not be happier with the results. I opened up the MyCareer mode to start on my path to wrestling superstardom and WWE 2K 18 proceeded to chokeslam me through a stack of tables. You cannot bring your own created wrestlers into MyCareer or the Road To Glory modes. You must start with one of a few pre-made wrestlers with an extremely limited moveset and earn the cyber currency 2K uses in all its sports games, VC. You spend the earned VC on loot crates that may contain moves, haircuts, shirts, etc. Everything you would need or want to make your wrestler your own is locked behind these awful loot crates. Prior to release, 2K issued a statement that WWE 2K18 would not be pay to win or feature conventional loot crates, a serious concern for WWE 2K fans who witnessed the turd blizzard around 2K’s crown jewel series, NBA 2K, a month earlier. While it is true that there are no real-money microtransactions for buying the loot crates, you will still have to grind for them if you actually wanted to play through the career modes. Any enthusiasm I had for these modes is dead and I felt that a giant chunk of my time had been wasted before I even got off the ground. I caved in and chose one of the generic wrestlers and started up MyCareer. The mode starts you off at the NXT performance center where the company trains the next generation of superstars. You are introduced to head trainer Matt Bloom, known by WWE fans as Albert, and you must work your way up the ranks of NXT in hopes of making the main roster and becoming a wrestling legend. All that sounds good, but the actual process is incredibly painful. MyCareer mode is a loading screen simulator. You will see a loading screen to do anything, even stuff as small as being delivered a single line of text dialogue from someone (once again, there is no voice over in any of the modes). Each day, you must choose to enter the performance center and then wait at a load screen. After passing the load screen, you walk your character over to Bloom, who is 6 feet away from you, and read a few lines of his text, then more loading screen. Sometimes, you load into a match, sometimes, you load into more loading screens. On the PS4, this is a nightmare, as some of the load screens last as long as 15 seconds for the character interactions and even longer for matches. On a top-end PC with SSD, the problem is not as severe, but some matches can still take more than 30 seconds to load up. The early training and tutorial bits are awful. You are given goals in the ring for a particular challenge and if you don’t meet them, you are in for more loading and more attempts at things that aren’t fun. If you hate yourself as much as I do, you eventually work your way up to the main roster. You try your best to exceed at any given opportunity, but it never seems to matter if you win or lose. How you progress in the company appears to be 100 percent at the mercy of some sort of predetermined script. I gave up around the 15 hour mark because I was still unable to look or play how I wanted with my character due to poor luck with the loot crates and always being forced into matches I didn’t feel like participating in. Things aren’t awful all around, though. With 2K dropping support for the PS3 and Xbox 360, the game was able to receive a visual facelift with an all new lighting system. It is the biggest graphical improvement to the series in years and looks pretty good. Many of the WWE stars were 3D scanned for inclusion in the game and some of them look very realistic. A few different arenas and backstage areas are now available for use and fighting into the crowd is possible in certain match types. Many of the moves look very good this year and lots of small improvements and animations are sprinkled throughout matches. Many of these small details are sure to please wrestling fans. It’s a shame that the actual wrestling is not very fun on its own. As in years past, certain gameplay mechanics have been changed and none for the better. The rapid button mashing of the older era games was never ideal, but I can’t really agree that the current timing/guessing system for kicking out of pins is an improvement. I almost always lose to the AI on any setting since I am almost guaranteed to fail the kickout or submission minigames. Ladder matches are just as bad, featuring a minigame that can best be described as trying to impregnate a spinning circle. If you can break through, your wrestler will be able to unhook a briefcase from a carabiner. All of these minigames take the focus off the parts of the wrestling that do work and do nothing but frustrate me. In my opinion, the real fun in WWE 2K18 comes from working with the character creation system and setting up AI vs AI matches. In addition to making your own roster of dudes, you can download community creations. The downloaded wrestlers are often incredibly well made and come complete with their own custom movesets, outfits, and entrances. You can also download custom uploaded images from the community for use as clothing decoration and tattoos. Sadly, there is no way to import or use custom music for entrances, which is a serious buzzkill and makes no sense to omit, especially for the PC version. While I don’t enjoy playing the game, I’m looking forward to creating virtual representations of my friends for the purposes of watching them get thrown off steel cages and hit with folding chairs. This review is based on the PS4 Pro and PC Steam releases. The keys were provided by the publisher. WWE 2K18 was made available for Windows, Xbox One, and PS4 on October 13th, for $59.99. The game is rated Teen. I don't like the smell of what they're cooking, brother. I haven't played a wrestling game since the N64 ones and it doesn't look like I'm missing out at all. I do enjoy your posts about that game!